While a large majority of Americans rate police officers positively on a 0-to-100 “feeling thermometer,” whites and blacks differ widely in their views, including among Democrats, according to a Pew Research Center survey conducted in August. About two-thirds of the public (64%) give officers a warm rating on the scale (between 51 and 100), including 45% who rate them very warmly (76-100). Fewer give a neutral rating of 50 (16%), and just 18% give a cold rating on the scale (0-49). But while a clear majority of whites give law enforcement warm ratings (74%), black and Hispanic views of police are more mixed. Just three-in-ten black Americans (30%) express warm attitudes about police officers, while 28% offer a neutral rating. Another 38% give a cold rating, including 30% who give a very cold rating (24 or lower on the 0-100 scale). Among Hispanics, 55% give police officers a warm rating, 25% give law enforcement a neutral rating and 17% have cold views. These racial and ethnic differences in views of police officers are consistent with previous Pew Research Center findings that blacks are less likely than whites to express confidence in the police in their communities. Views of police officers also differ substantially across age groups. About half (48%) of adults younger than 30 give a warm rating to law enforcement, 22% are neutral and another 29% are cold in their assessments. By comparison, 80% of adults ages 65 and older rate police officers warmly, including 61% who have very warm views. Notably, while greater racial and ethnic diversity among younger adults accounts for some of the age differences in these views, there are significant age differences within racial and ethnic groups. For instance, 28% of whites younger than 30 give cold ratings to officers, compared with just 6% of whites 65 and older. And while just 27% of blacks ages 50 and older offer a cold rating for police officers, that rises to 46% among blacks younger than 50. Police officers are also viewed more positively by Republicans than Democrats. 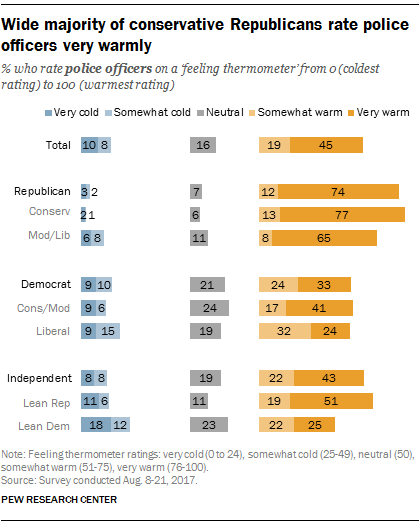 Among Republicans, 86% give officers a warm rating, including 74% who rate officers very warmly. 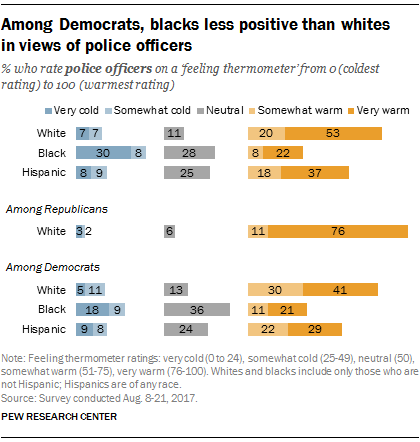 Among Democrats, 57% give officers a warm rating on the scale (including just 33% who rate officers very warmly), while 21% offer a neutral rating and 19% offer a cold rating. Conservative and moderate Democrats (58%) and liberal Democrats (56%) are about equally likely to rate officers warmly, but liberal Democrats are less likely to offer a very warm rating. As in the public overall, older Democrats express warmer views of police officers than younger Democrats do. While 70% of Democrats ages 65 and older have a warm view, that compares with fewer than half (46%) of those younger than 30. Three-in-ten Democrats ages 18 to 29 give officers a cold rating. There is also a substantial racial and ethnic divide in views of police officers among Democrats. While just 32% of black Democrats offer a warm rating of officers, that rises to 52% among Hispanic Democrats and 71% among white Democrats. Although white Democrats have more positive views of the police than black and Hispanic Democrats, a substantial partisan divide remains among whites: 71% of white Democrats have a warm view of police officers, compared with 87% of white Republicans. This gap is even more pronounced in the shares who rate officers very warmly (41% vs. 76%).